Photo courtesy of BM2 Ron Ritchie. 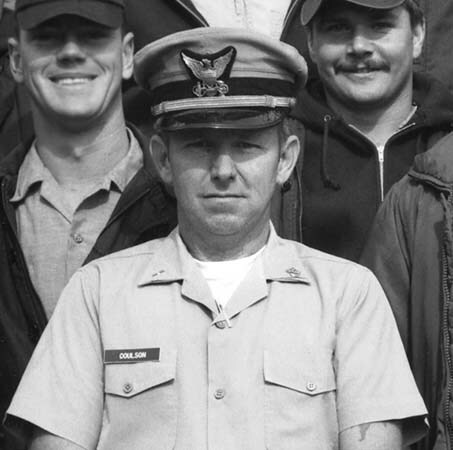 CWO4 Rex W. Coulson was my CO from June through December 1967 when I was stationed there and I worked directly for him most of the time as his yeoman. I thought he was a great guy and we got along great. I kept him supplied with USCG recruiting goodies (bumper stickers, window decals, matches, etc.) for 2.5 years after I was promoted and transferred to recruiting duty. At the end of his tour on Peanut Island he was transferred to the Commanding Officer position at Coast Guard Station Ft. Pierce, the next search and rescue station up the coast to the north where he served another four years prior to his retirement. My dad and I visited him there in the early 70's and he had it made there for his last duty assignment prior to retirement. CWO4 Coulson passed away at the age of 77 on October 5, 2002, in Oveido, Florida. Rest In Peace CWO4 Coulson and thank you for being a great unit Commanding Officer and a friend for years. "SECTION TWO--PAGE FOURTEEN THE NEWS-PALLADIUM, BENTON HARBOR, MICH. -THURSDAY, JULY 11, 1957"
1. Do not go out in bad or threatening weather. 2. Wear your life preserver, or have it ready for instant use, for the wash from another vessel may capsize your boat, even on a calm day. WHERE ARE YOU GOING? 3. WHERE ARE YOU GOING? Tell people where you are going and then do not go somewhere else. Statistics have shown that this procedure improves your chances of rescue more than 100%. 4. Equip your boat properly. Do you have an anchor? Life preservers? Oars? Spare gas? A flashlight? 5. Avoid excessive speed, for you may be thrown overboard by a sudden turn, suddenly gunning the throttle, or hitting a floating object. Many injuries have also resulted from runaway boats, not only to their operators, but to swimmers and other boats as well. 6. Know how to swim. Only a very good swimmer should risk water travel alone. 7. Let your friends or relatives know when you expect to return from your boating trip. Then, if you do not return on schedule they can notify the Coast Guard. 8. If you should accidentally capsize, hang on to your boat until help arrives. Most fatalities from this sort of mishap result from someone trying to swim to shore when their boat turns over. They become exhausted and drown. 9. Never panic. A thinking person is many times safer than one who is hysterical. 10. Do not overload your boat, for the less freeboard you have, the more chance you have of being swamped. 11. Avoid horseplay. Fooling around in a boat is one of the major sources of boating accidents. 12. Keep well clear of bathers and swimmers. This is much easier for the boater to do than the swimmer, who is relatively immobile in water. 13. Familiarize yourself with the area in which you operate. Contrary to popular belief, familiarity breeds respect, not contempt. The safest man is the man who knows precisely what lies ahead of him. 14. Always reduce your speed in narrow passages and congested areas. If you observe all these water safety rules, you deserve a first class rating as a safe boater, but there is one final danger that you should be on the alert for -- the waterborne hotrod. This is the menace that cuts in and out of crowded areas, swimming beaches, and other boats, always at high speeds, and never with a thought for the rights of others. He is dangerous, so be alert. "Another New Years' poem was penned, this time by crewman CHBOSN Rex W. Coulson:"
That although he's hung over, here comes my relief.